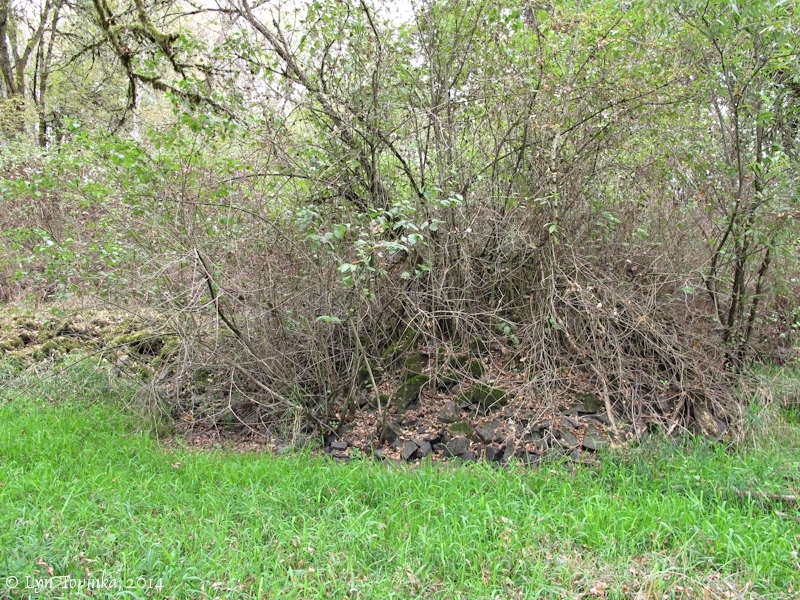 "Basalt Cobblestone Quarries District ... Ridgefield NWR, Washington"
Click image to enlarge Basalt Cobblestone Quarry, "Fowler Lake South", Ridgefield NWR, Washington. 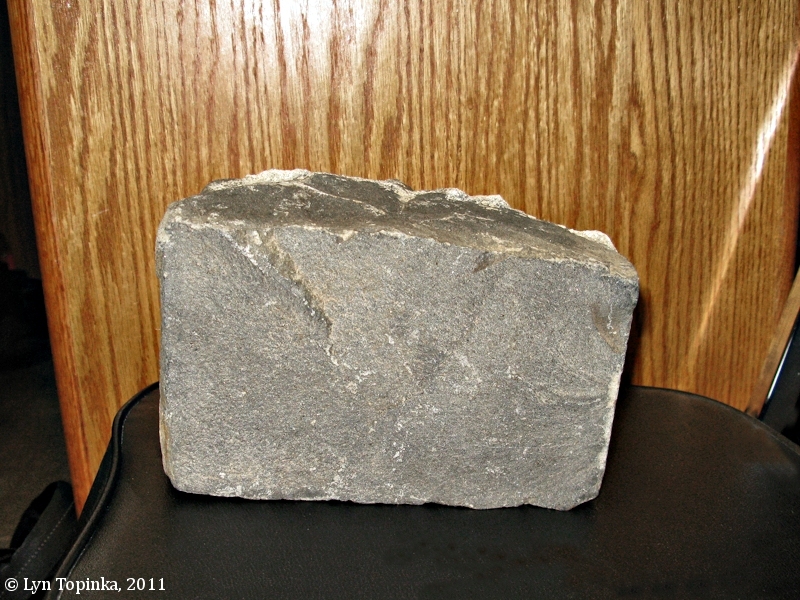 Image taken September 23, 2011. 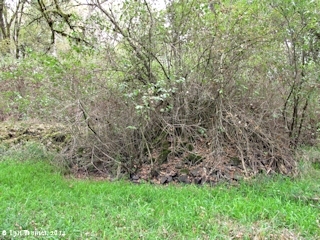 The Basalt Cobblestone Quarries District (also known as 45-CL-113H), is located on the Carty Unit of the Ridgefield National Wildlife Refuge, and was added to the National Register of Historic Places on December 14, 1981 (District #81000587). 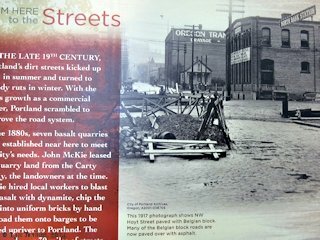 Between approximately 1880 and 1910 basalt chunks were quarried at seven different locations and then barged up Lake River to Portland, Oregon, where they were chipped into paving stones known as "Belgian blocks". "... 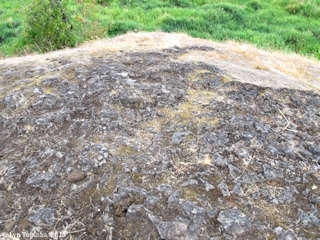 Seven basalt cobblestone rock quarries lie on the floodplain of the Columbia River approximately two miles north of Ridgefield, Washington. 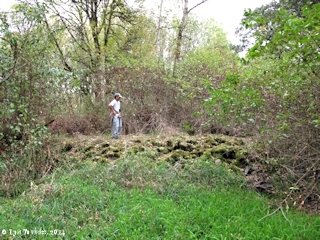 The floodplain here exhibits a rolling topography, characterized by basalt knolls surrounded by low areas of alluvia silt which are seasonally flooded. 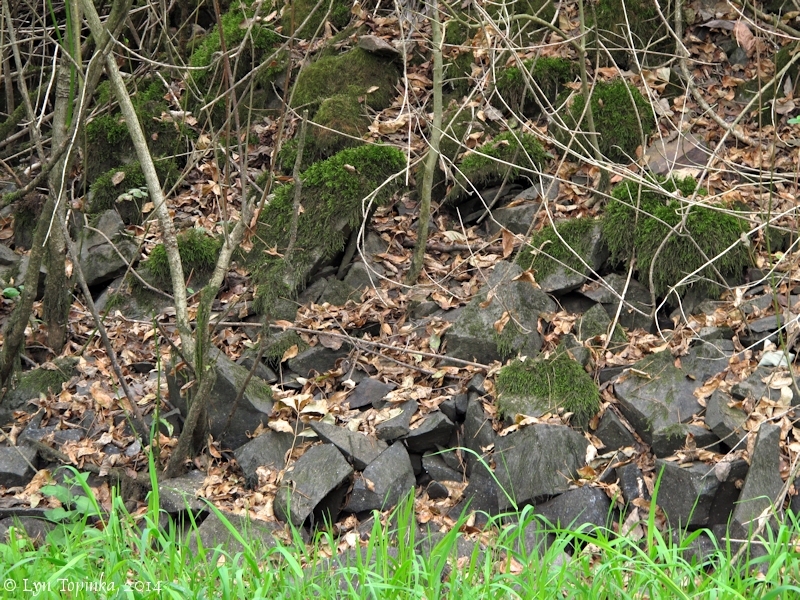 The quarries are located in the sides of these knolls, and a rock road of the same material connects the quarries with Lake River. The only visible remains of the quarry operations are the quarries and their associated piles of tailings, and the two sections of rock haul road. 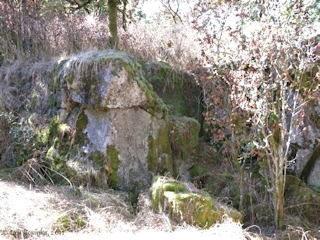 The walls of several of the quarries have fallen in, and they are overgrown with trees and brush. 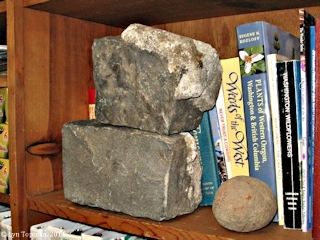 ..."
Source: Basalt Cobblestone Quarries District's National Register of Historic Places Nomination form, 1981. 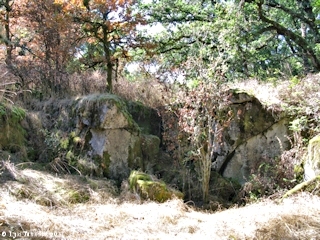 The basalt knolls in which the quarries were worked are Grande Ronde basalt of the Columbia River Basalts . These flows are massive fissure lava flows which covered much of Idaho, Washington State, and Oregon between 17 and 5.5 million years ago. Approximately 300 thick sequences were erupted from north-south fissures near the present-day Washington-Idaho border. 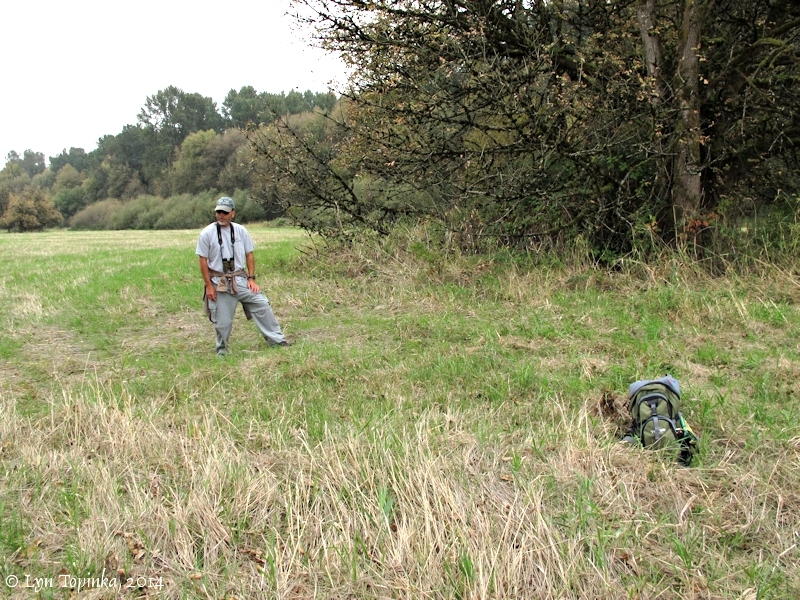 They ranged from 10 to over 100 feet in thickness. Twenty-one flows poured through the Columbia River Gorge forming layers of rock up to 2,000 feet thick. Between 15,000 and 12,000 years ago an ice dam burst in Montana, resulting in the massive "Missoula Floods". Over 400 feet of water rushed over the Vancouver Basin, inundating the area from Washougal to Woodland, stripping some areas of surface material and depositing flood material in other areas. Recent LIDAR images show the basalt flows underlying St. Helens, Oregon and Ridgefield, Washington were stripped clean of any surface material. 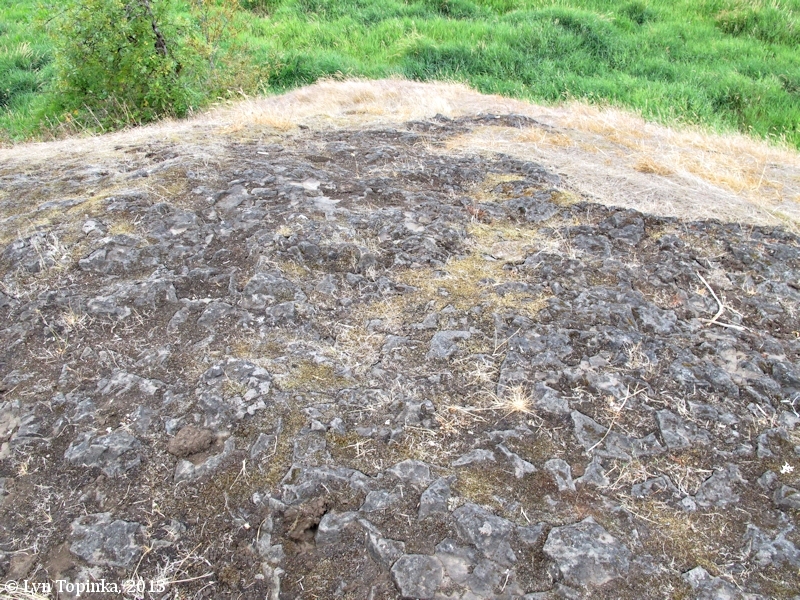 Click image to enlarge Basalt knolls, just north of the Carty Unit (but reached via the Carty Unit), Ridgefield NWR, Washington. Overcast gray day. Image taken August 10, 2013. 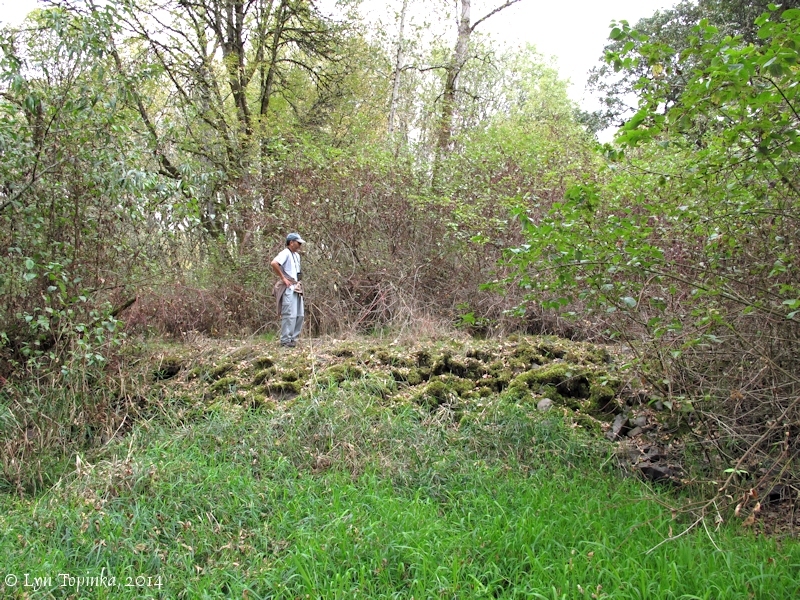 Click image to enlarge Basalt knolls, just north of the Carty Unit, Ridgefield NWR, Washington. Overcast gray day. 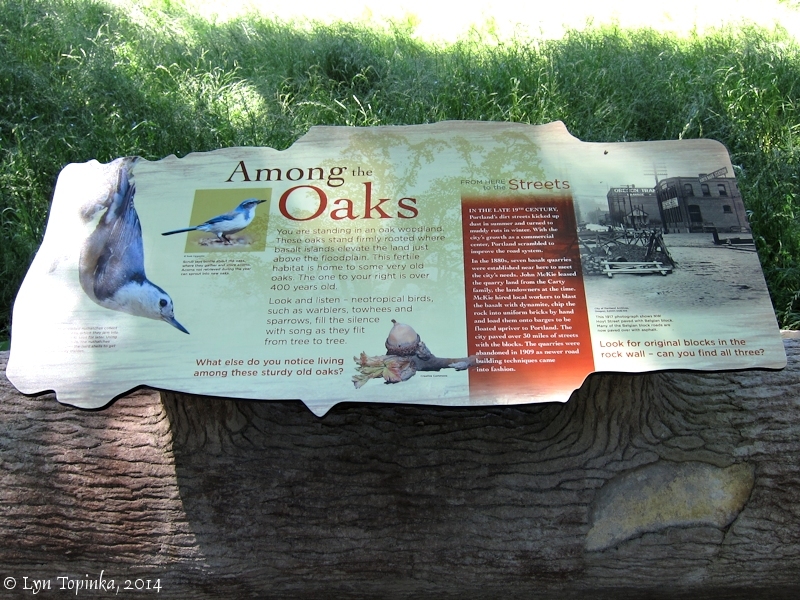 Image taken August 10, 2013. Click image to enlarge Wide-angle panorama, basalt knolls just north of the Carty Unit, Ridgefield NWR, Washington. Overcast gray day. 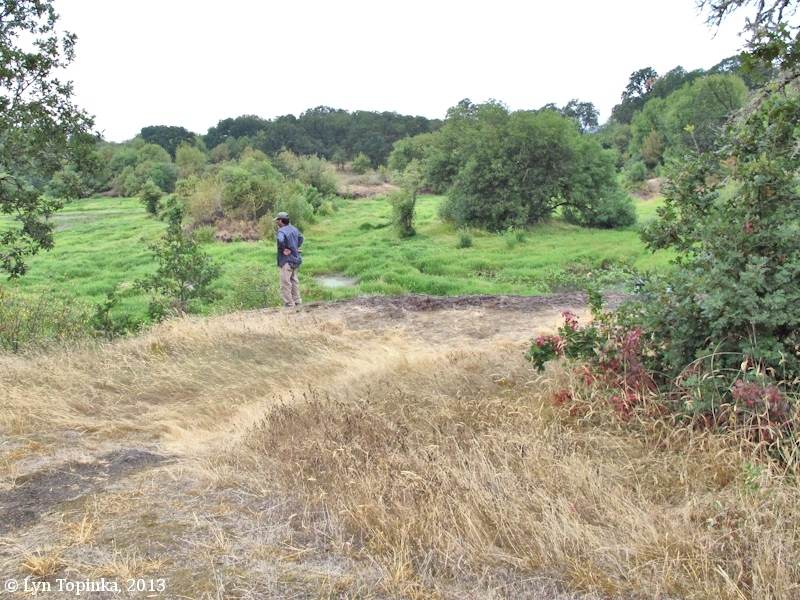 Image taken August 10, 2013. 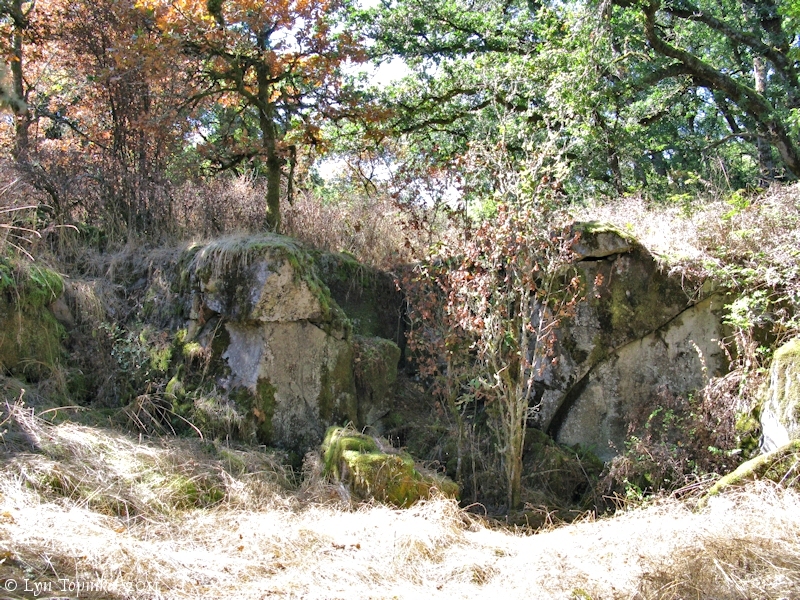 In 1981 seven historic basalt quarry sites on the Carty Unit of the Ridgefield Refuge were listed on the National Register of Historic Places, as the "Basalt Cobblestone Quarries District". The "Long Meadow Quarry" and the rock haul road associated with it are recorded as "45-CL-113H". The other six quarries were grouped together, possibly under site number "45-CL-161H", however information about this number is missing (FWS, 2010). The quarries have no official numbers or names (at least that this web author could uncover) but are identified on this website according to their location. 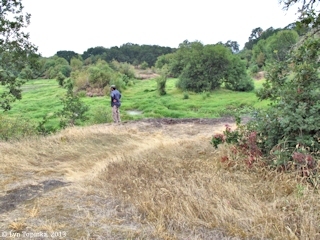 "Long Meadow" quarry and associated rock haul road, located at the northeast end of Long Meadow, lat/long of haul road obtained in field via Garmin, 45°50'33.2"N, 122°46'27.9"W.
"Gee Creek" quarry, located on the south bank of Gee Creek, approximately 1/4 mile northeast of the Long Meadow Quarry, lat/long (determined off map) 45°50'42"N, 122°46'11"W.
"Fowler Lake South" quarry, located on the south bank of Fowler Lake, lat/long of quarry obtained in field via Garmin, 45°50'10.4"N, 122°45'43.8"W.
"Fowler Lake West" quarry, located on the west bank of Fowler Lake at approximate lat/long (determined off map) 45°50'27"N, 122°45'56"W.
"Fowler Lake Island" quarry, located on the western shore of the island in the center of Fowler Lake, at approximate lat/long (determined off map) 45°50'24"N, 122°45'50"W.
"Fowler Lake Channel" quarry and associated rock haul road, located on the northwestern bank of the northeast channel entering Fowler Lake, at approximate lat/long (determined off map) 45°50'30"N, 122°45'34"W.
"Oaks to Wetlands Trail" quarry, located at the northern boundary of the Refuge and just west of Boot Lake, at approximately lat/long (determined off map) 45°50'26"N, 122°45'06"W. We have searched for this quarry twice but the area is very overgrown and so far we have not located the quarry. 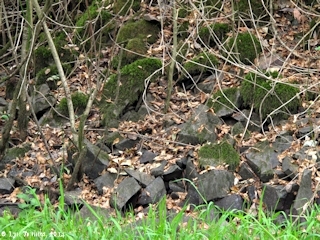 Click image to enlarge Basalt Cobblestone Quarry, "Fowler Lake South", Ridgefield NWR, Washington. Nice sunny day. Image taken September 23, 2011. 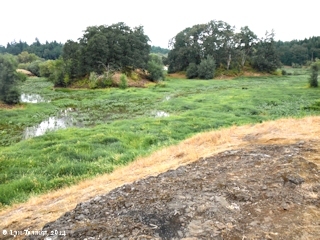 Click image to enlarge Quarry tailings, "Long Meadow", Carty Unit, Ridgefield NWR, Washington. Overcast day with front moving in. Image taken October 10, 2014. 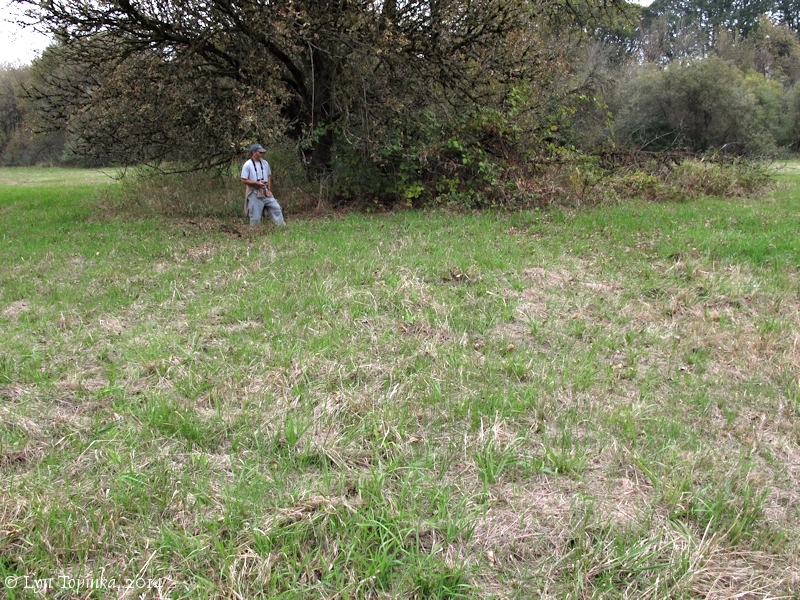 All that remains visible of the "Long Meadows" Rock Haul Road is a slight rise in the landscape, approximately 12 feet wide, which drops off again on the other side. 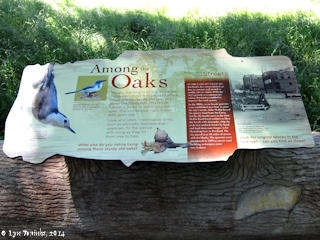 The original road ran southwest from the quarry to Lake River. Today a clump of trees splits the road remnants in to two small sections. Click image to enlarge Rock Haul Road, "Long Meadow", Carty Unit, Ridgefield NWR, Washington. Overcast day with front moving in. Image taken October 10, 2014. 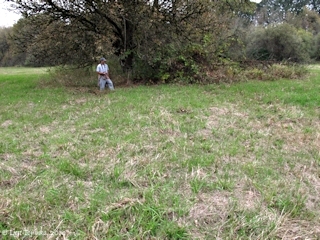 Southwestern section, looking northeast. 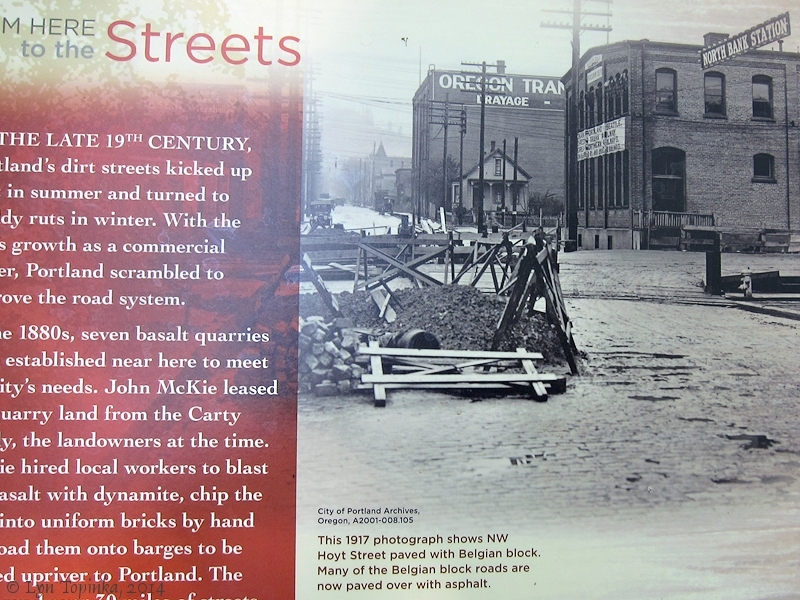 Photograph taken while standing in the middle of the approximately 12-foot-wide road. 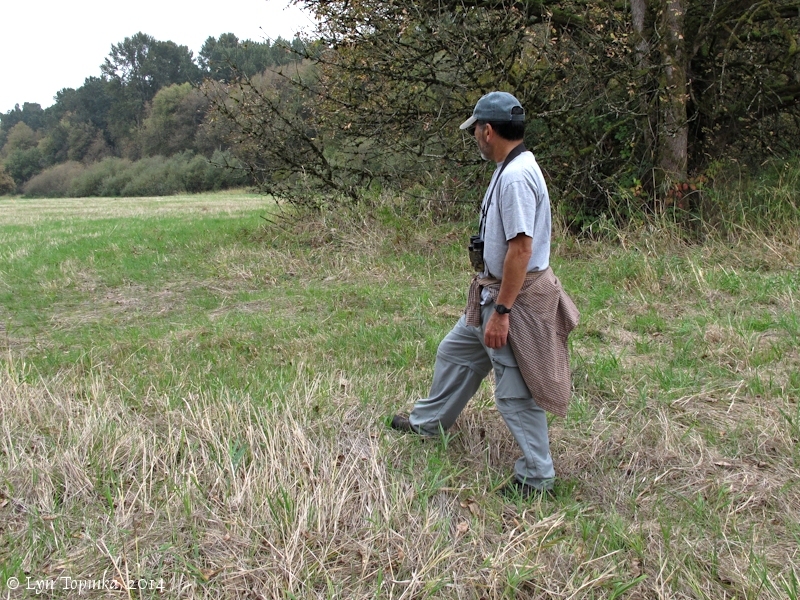 Click image to enlarge Rock Haul Road, "Long Meadow", Carty Unit, Ridgefield NWR, Washington. Southwestern section, looking north. Overcast day with front moving in. Image taken October 10, 2014. Northeastern section, looking south-southwest. 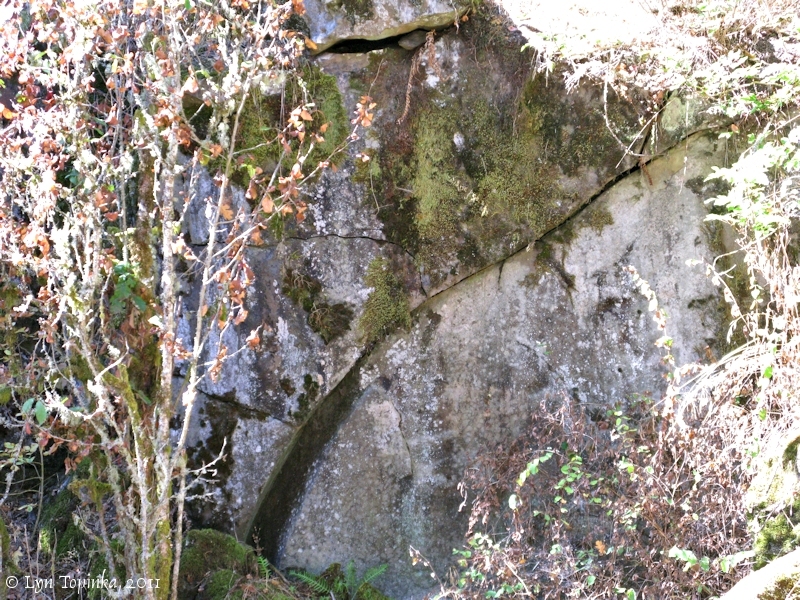 The rock haul road is approximately 12 feet wide, with the dropoff visible (dead grass area, middle left). 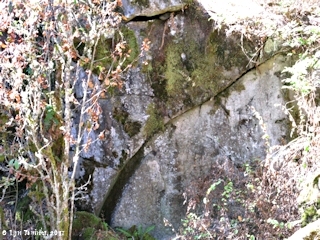 Northeastern section, looking south-southwest, showing both sides of the rock haul road with rise in the middle. 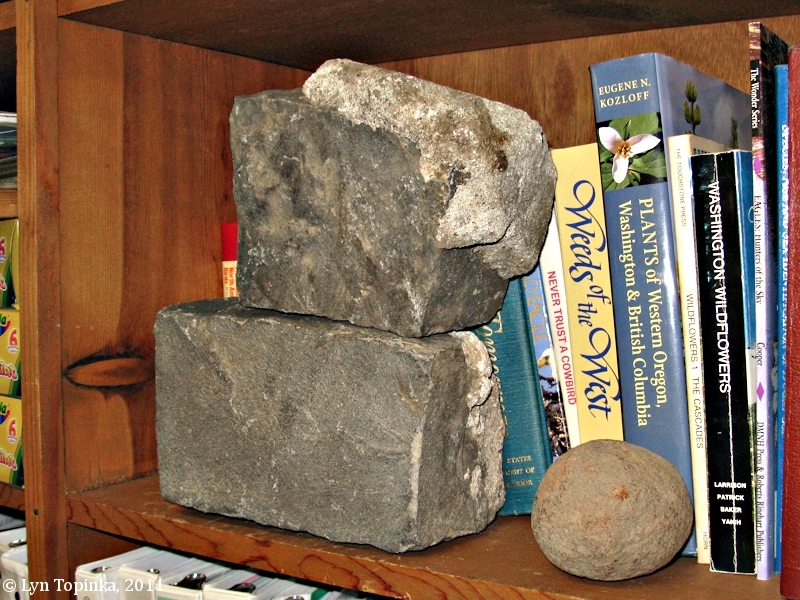 The rock haul road is approximately 12 feet wide.